Hale Honu (Turtle House) is our Big Island ocean view rental and is our place of refuge. We would like to share this top Hawaiian vacation area with you. Situated on the Big Island of Hawaii just twenty miles south of Kailua-Kona, Hale Honu is surrounded by a lush tropical garden, and provides a breathtaking panoramic view of the Pacific Ocean, in a quiet and comfortable setting that is conducive to uplifting the light-of-heart and soothing the frazzled spirit. From this location you are minutes from the lovely Ho'okena Beach State Park for a beach vacation of sunbathing and swimming with dolphins, or visiting the famous Place of Refuge National Historic Park, a preservation of ancient Hawaiian culture. Also at the Honaunau Inlet you will snorkel with an endless variety of tropical fish and sea turtles. A ninety-minute drive south will bring you to Volcano National Park. Thirty minutes north are the shops and fine restaurants of Kailua. Along the main highway north you will pass shops offering the island's best buys for Kona Coffee and Macadamia Nuts. A fruit stand offering organically grown fruits and vegetable is less than one mile north. The Kealia village store with necessities and movie rentals is a short walk to the south. Bob Hofmann and Nancy Bolt are both retired. Nancy served as the Colorado State Librarian for 18 years but she continues library consulting work. Bob is retired from a 30 year career with General Electric where he worked as an electrical engineer. He also served in sales and marketing. Nancy and Bob now work together selling Bulgarian jewelry to support Bulgarian libraries and organize tours to Bulgaria. We are part owners of a rental apartment in Sofia Bulgaria in case you’re interested in a really interesting place to visit. Hawaii is wonderful place to visit and a top vacation destination. The Big Island is, we think, the best of all the islands. The volcano is spectacular, we have two mountains soaring to almost 14,000 feet, it offers world class sport fishing, beautiful beaches, a rich history, the best snorkeling and most of all for our location, a grand place to just go relax and get away from the hubbub of life. 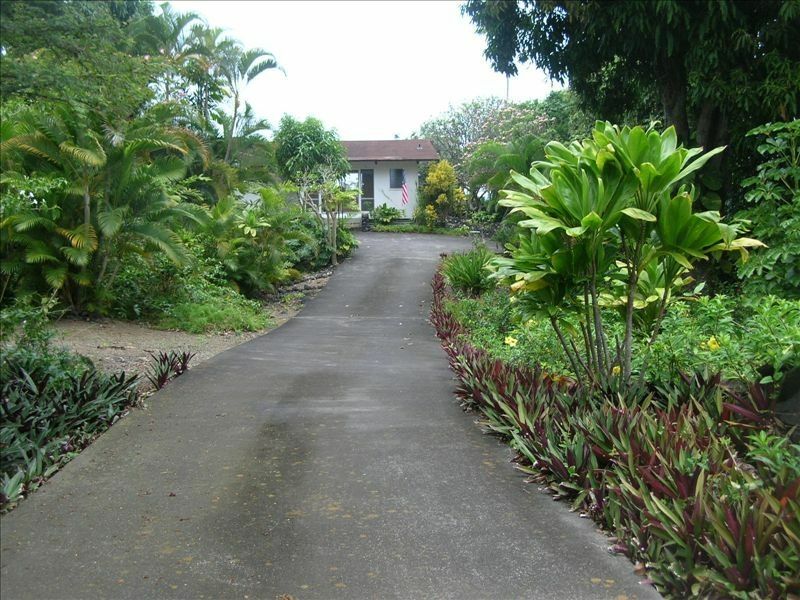 Beautiful Big Island surroundings that offer a peaceful and quiet vacation getaway! A perfect place for a romantic Hawaiian escape or a private family coastal retreat. Landline phone service is free for local calls. Long distance calls require card payment. Linens are provided for all beds. High speed internet is provided by Hawaii Telcom. Bath towel sets are provided to serve up to 10 guests. Beach towels are available. The living room includes sofa and love seat, coffee table and a high quality stereo with CD player. A 12 cup Cuinaire Coffee maker and grinder is provided. A two slice toaster is provided. Many standard non-persihable items and a large variety of spices are provided. We try to provide dishes and utensils as needed to serve 8 people for most entertainment occasions. This kitchen provides preparation equipment needed to prepare and serve 8 guests for many cuisine type. There are three dining areas. A breakfast nook area, a formal dining area and the lanai. The lanai is most widely used. Two flat screen televisions are provided. One in the family room and one in the master bedroom. Satellite service is provided by Directv for both sets the family room set includes recording capability. A comprehensive set of Hawaii guide books and literature is located in the book shelf next to the front entrance. Novels and non-fiction books are also available. Games are located under the TV stand in the family room. Toys are located in a basket in the family room. Several sizes of Snorkeling gear along with tubes are located in lockers on the south side of the lanai. Owners never got in touch with us to give is arrival instructions. We had to find a neighbor who gave us the lockbox code for the house as the owners never responded to messages and calls prior to arrival, causing great anxiety as to whether we had a place to stay or not. The cleaning lady came late and didn’t have time to vacuum. There was a lot of gecko poo on most walls, picture frames etc. that gave us pause. We made it work, but I wouldn’t stay there again. Nancy and I are delighted to welcome you to Hale Honu for the period Feb. 17 – 22, 2019. The cost of your stay will be as quoted by VRBO. We understand that there will be 4 adults in your party. The house key for Hale Honu will be in a lockbox located at the front entrance when you arrive. The lockbox code is XXXX (omitted here for security). Please leave the key in the lockbox when you check out. If you arrive after dark, you may need a flashlight of some kind to get into the lockbox and open the front door. It appears that these guests failed to read this message. We are now trying to get guests to confirm to us that they receive our correspondence. Check in time at Hale Honu is 4 pm. These guests arrived at 11 am. Our caretaker arrived at 1 pm to do the final cleaning work, and was surprised to find they had already checked in and made themselves at home. Geckos are difficult to live with in Hawaii. I believe they predate our arrival however. It is virtually impossible to keep them out. We do spend lots of time cleaning up after them, but can’t be there every moment. Our caretaker is very diligent. She arrived at 1 PM intending to do the final vacuuming and cleaning up after the geckos prior to the guest's arrival because it had been several days between bookings and she wanted the place to look as fresh as possible. These guests did not want her to complete this work. We cannot be responsible for the condition of the property for guests who check in prior to the published check in times. We will not rent to these guests again. Spacious home in beautiful location! Our family of 7 had a wonderful week here at Hale Honu! Plenty of room for all of us with two large living areas, three bathrooms, 2 bedrooms, updated kitchen and a huge lanai with an amazing view down to the ocean. Beautiful wood beamed ceilings and the entire west side is windows looking out on the ocean view. Comfortable couches and beds which is always a plus! The resident geckos were charming, the singing frogs at night, roosters and boars-it was a treat!-and we really did swim with dolphins at the nearby beach-our kids still can't believe that just magically happened one day. Must be in Hawaii! Lots of pros for this property and we would stay here again, but I appreciate thorough reviews on VRBO, so with full disclosure this property can feel a little far from town and many of the best beaches-30 to 60 minutes of driving one way, but it is a beautiful drive. Also the home could use some updates. Not fancy or pristine, but very comfortable and priced very well. Thanks Hale Honu for sharing your slice of paradise with our family-we had a wonderful time! The house was comfy, with a perfect lanai to watch the sunset, eat meals, talk and play. Very kid friendly which is important for us! Really close to hookena and place of refuge for snorkeling and sweet kekie beach. Thank you, we loved our time here! Thank you Kate for your nice review. We love understanding tenants! Hale Honu is a good location for day trips, but the property itself was interesting enough to our children that nobody complained when we decided to stay in. A small assortment of toys was provided, plus beach chairs, umbrellas, and some snorkeling gear, and we added a couple boogie boards to the collection. The Lanai was the favorite part of the house for my wife and I, and we spent much of our time, and all of our meals on it, enjoying the beautiful, though distant ocean views. The geckos were a hit with everyone, as they zipped around eating gnats, and joined us for our meals, drinking condensation puddles from our drinks and even lapping fresh liliko'i juice from my animal loving daughter's hand. A herd of pigs lives on an adjacent property which intrigued the kids, but thankfully produced no foul odors or noises. The house itself is dated, though comfortable. A caution to those who may be sensitive sleepers: there is no a/c, so the evenings can be warm, though we found it tolerable since the elevation is significantly above sea-level. Additionally, the windows must be kept open to let the house cool, and there is an assortment of rather noisy creatures (birds or insects) many of which like to stay up all night, plus one really ambitious rooster. After a brief adjustment period we found even this to be tolerable, and just became part of the charm of the place. Captain Cook is just 15 minutes away, and Pu'uhonua O Hōnaunau National Historical Park (place of refuge) and numerous beaches with excellent snorkeling are half that distance. Even closer is a fruit stand that sells excellent smoothies. Stayed for a week with a family of 8. Had a great time. Lovely home, couldn’t wish for better base. Wonderful tips from Robert on things to do/grocery shop. Kids were excited with visits from geckos on lanai and daily sightings of mongoose and wild hogs. If you are light sleeper, i’d suggest ear plugs - the frogs at night are loud! We happen to enjoy their songs :). Nearby Ho’okena beach is great - small, mostly visited by locals. Go early (before 9) to see spinner dolphins, and a bit later (after 10:30-11am) to swim with the turtles - they come very close, so even my 6 year old got to snorkel alongside with them. Fish are always there :). Thank you Hale Honu! We are delighted that you were able to enjoy Hale Honu the way we hoped you would. Felt very comfortable in this open house. Close to Captain Cook Bay, Two-Step Beach and Hookena Beach. True to the advertising - we swam with dolphins three times! We are glad the Nelsons enjoyed our house and that the dolphins cooperated with our advertising. Aloha. The total rental amount is the sum of the nightly rental amount plus the cleaning fee. Check-in and checkout times: Check-in time is 4:00 p.m. We are, however, flexible for bookings that are not back-to-back. Check-out time is 11:00 a.m. We appreciate your cooperation as our house cleaning crew potentially has a short time window to complete their work prior to the arrival of our next guests. Cancellation policy: Deposits are refundable less a $10 processing fee up to 30 days prior to check-in. A cancellation fee of $200 is charged thereafter if the property cannot be rented to a third party.